My 19 year old son and his 17 year old girlfriend decided that they wanted to buy a puppy together, they didn't tell anyone what they were planning. The dog would live at my house! They had asked me one day what kind of dog I would get if I ever got a dog. I said a Jack Russell. They also asked her mother and she also said a Jack Russell. So in early May they called me from a pet store and said they were holding the cutest Jack Russell puppy and would it be okay if Jordan bought a dog. I said absolutely not - for many reasons, and I certainly didn't want they to get a dog from the pet store at the mall! Also, we all work or go to school full time - no one would be home during the day to take care of a puppy, so I really didn't think it would be fair to the puppy. Well they decided against the pet store puppy and started doing some online research about breeders in our area. All the time they were keeping quiet about it. When they finally put a deposit on a puppy, they told me and Morgan's mom but not either of their dads who were completely opposed to a dog. I kept warning my husband that I thought that they were going to get this puppy and he kept saying that if a dog came into the house he was leaving! Morgan's dad was kept completely in the dark - he had made it clear there would never be a dog in his house. They picked up Riley on May 24 - he was the cutest thing we had ever seen - my husband fell in love immediately!!! Needless to say we all have fallen in love with Riley - we can't imagine life without him. 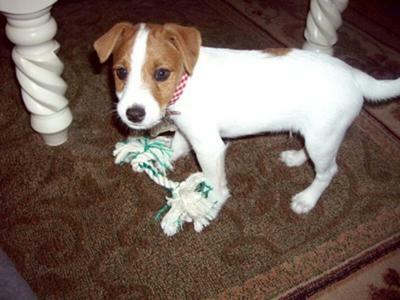 We had done a lot of reading about the breed and were a little worried about having a Jack Russell. Riley is the sweetest little boy ever - he is pretty mellow, he loves to run around and play, but he also like quiet time too. He is well behaved, loves people, loves other dogs and is beginning to get along with our two cats (it was more the cats problem than his - he wanted them to play!). He is crated when we work and he doesn't mind it at all. Thank you Jordan and Morgan for bringing this little love into our lives!